It’s no mystery why people are nuts for nuts. They are tasty, make fantastic snacks, and are a perfect trail food for a much-needed energy boost. Many of our favorite meals and desserts have nuts mixed in with them. They also come in different forms—either processed as creamy nut butters or turned into alternative dairy products like cheese and milk. Peanuts rank as the most popular nut in the world, despite the delicious irony that it isn’t even a nut to begin with (it’s a legume!). They’re found in our favorite candy bars, as well as in many sandwich fillings. Peanuts can be enjoyed in a variety of ways—boiled, steamed, salted, or plain. This honorary nut contains among the highest servings of protein, and the consumption of peanut skin has been shown to improve low platelet counts. Almonds are true nuts, with a 30-gram serving containing more vitamin E and fiber than any other nut, which leads to reduced LDL cholesterol levels. They are also considered a fantastic source of magnesium and manganese. Their silky consistency has also enticed people to consume them as nut-based milk, and their state as a nut butter has gained them a steadfast fan base as well. They’re literally a hard nut to crack since it takes forever to get them out of their shells. And while they can leave a bad taste in the mouth when eaten raw, they are still among the most popular nuts in the world. This is mostly chalked up to their versatility and ability to pair well in any dish. Chopped walnuts in brownies? Delicious. Chopped walnuts in a salad? Delectable. Chopped walnuts in cookies? More please. They also have higher levels of omega-3 compared to their other nut cousins, as well as higher levels of antioxidants. They also contain significant amounts of melatonin, which is an effective weapon against insomnia. Cashews are the belle of the bowl—any bowl of mixed nuts, that is. Their unique, but non-alienating shape and creamy consistency make them an ideal snack that even toddlers can be able to recognize and reach out for. What’s more, vegans sing their praises as a replacement for milk and cheese. They contain a surprisingly low fat content compared to other nuts. In addition, they contain anacardic acid, which greatly improves insulin sensitivity, making them a wonderful snack for people with diabetes. Even though it takes what feels like forever to successfully extract the sweet nibbly nuts within, shelled pistachios still remain among the most popular nuts in the world. You know you’ve made it as a nut when a country has devoted an entire gelato flavor for you. Some desserts of entire countries are considered incomplete without a heap of its powdered contents. This could be due to pistachios having among the highest flavonoid and polyphenol content of all tree nuts. Snacking on pistachios also has positive effects on glycemic control, obesity, blood pressure, and inflammation, especially with patients of diabetes. 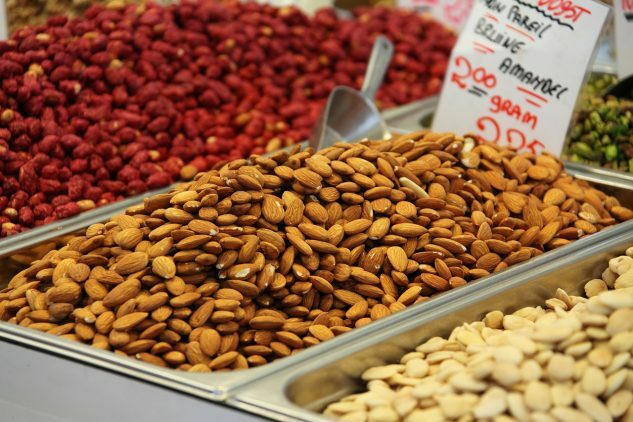 Nuts are nutritious and healthy, but evidence suggests that snacking on them should be limited to about a fistful a day, with them being so high on fats and carbohydrates. Experts also recommend against chowing down on the overly salted and sugary versions, as an excess of sodium or sugar would outweigh the benefits of nuts.